There has been a church on the site of the Hanging Church in Cairo since the third century. 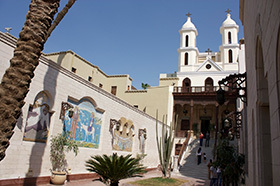 The current building is one of the oldest churches in Egypt, although its exact origin date is not clear. Many scholars estimate the existing Basilica-style building was constructed sometime during the fourth or fifth centuries. The earliest official mention of the church did not happen until the time of Coptic Patriarch Joseph I (831-849). The building was constructed on top of a Roman fortress, the entrance gate for which was discovered under the church during restoration work in 2011. The church’s roof is said to have been built in the same shape as Noah’s ark. It sits in a compound close to Cairo’s first mosque and one of the country’s oldest synagogues.